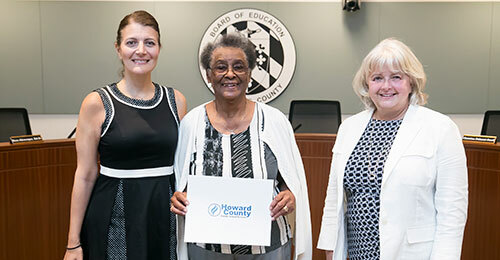 At the August 23 Board of Education meeting, HCPSS Superintendent Michael J. Martirano honored Ruth Conway, who served the school system as a substitute teacher for 43 years. Over almost half a century, Conway tried her hand at teaching every level but found her calling working with high schoolers, especially in the English and language classrooms. “Ms. Conway has the heart of a true educator and represents what we do at our very best,” Dr. Martirano said as he recognized her commitment to Howard County students and education.